You say, “Just because I’m a feminist, doesn’t mean I should accept all types of feminism”. No, you need not agree with all types of feminism, you just have no basis to say that other types of feminism are less valid forms of feminism than yours. It’s not that you don’t agree with other forms of feminism that would make you a bigot; it is more likely that your visceral aggression toward those who do not believe in feminism would make you a bigot. And just to correct you, I do not face “opposition” from “women and feminists” – in my experience, I only seem to get opposition from *feminists* (male or female) characterised by a notably fanatical and dogmatic disposition. It is interesting that you wave away abuse and insults as mere “opposition” that I should “expect” as “retaliation”. One can only wonder why feminists resort to these tactics in lieu of any actual intellectual substance. It is yet another demonstration of feminist “integrity” that you are perfectly happy for non-feminists to be abused and insulted, and yet decry instances where feminists allege the same. So let me get this straight. You are saying that I inhibit Muslim women from speaking out against misogyny merely because I work through the prism of Islam, rather than a demonstrably irrational ideology (i.e. feminism) – even though I am a woman who speaks out in public and actively encourages other women to do the same? If so, I would humbly urge you to take a step back, and take a good look at your reasoning, for the sake of sanity if not sincerity. 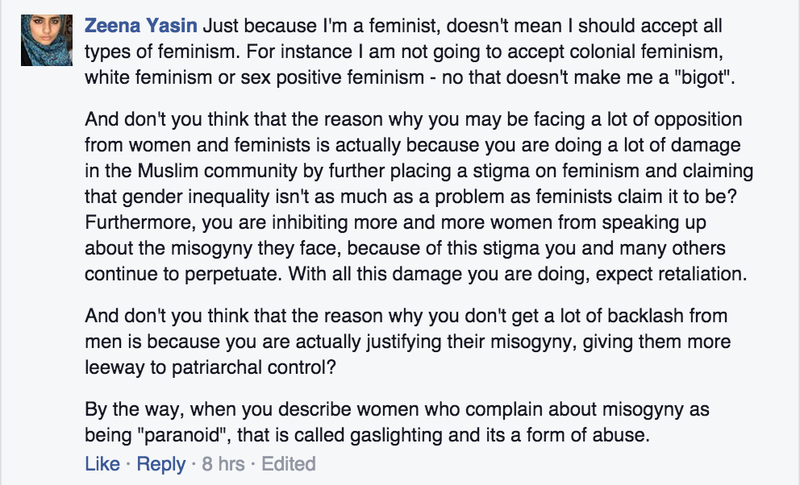 You feel that I am doing “damage” to your campaign for feminism in the Muslim community. If that is the case, it is more due to the brittleness of feminist ideas, rather than my simple questioning of it. In case you’re not familiar with my work, I do not get invited to discuss “the merits of misogyny” or “the pleasures of patriarchy”, or to justify any stance which takes away women’s rights. Quite the opposite. I have championed Islamic rights for all Muslims – male and female – under the rubric of Islam’s more enlightened conception of justice. In fact, it is *because* of the necessity for *justice*, and not the gender sectarian politics of feminism, that I criticise feminism. It is absurd to suggest that one has to be a Feminist in order to care about women’s rights, as it is absurd to say that one has to be a Zionist in order to care about the elimination of anti-semitism. The problem with feminism is not that its advocates are “paranoid”, but that they are predisposed with an ideological bias that makes their understanding of the world notably skewed, and therefore incapable of producing just solutions. Islam, unlike feminism (yes, even your form of feminism), neglects or privileges no segment of society – male or female. Islam, unlike feminism, stigmatises and maligns neither the male nor the female. In the public sphere, I have the pleasure of working alongside many amazing and intelligent Muslim women and men, who advocate Islam as the forum of justice without counter-productive, irrational add-ons such as feminism, and I will continue to encourage others to do the same, inshaAllah. It is fairly self evident that I would be invited by organisations who agree with what I have to say. To expect otherwise, is the same as expecting an animal rights forum to accept its speakers wearing animal fur, or expecting the lib-dems to accept its politicians preaching UKIP values. 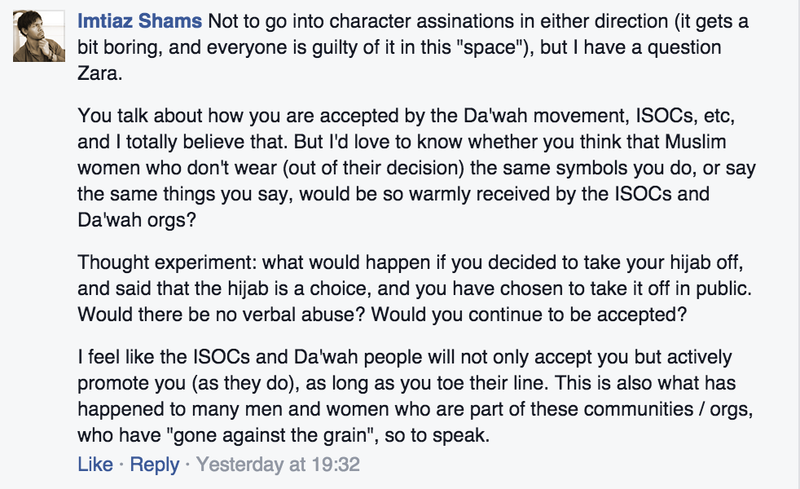 The argument made by Sara Khan et al, is that ISOCs are intolerant of those who advocate women’s rights, yet I am a female speaker who advocates women’s (and men’s) rights according to Islam, without opposition from the Muslim community. I doubt the Council for Ex-Muslims would invite an ex-atheist who became a staunch Muslim to speak about truth. ……It is absurd to suggest that one has to be a Feminist in order to care about women’s rights, as it is absurd to say that one has to be a Zionist in order to care about the elimination of anti-semitism. May Allah swt preserve you Sister Zara! !